We offer nursery care for the young and the restless during our church services from September – May. Visitors can check with the greeters when they arrive at church for directions to the nursery room. Sunday school for children in pre-school through 8th grade is held every Sunday, September – May. 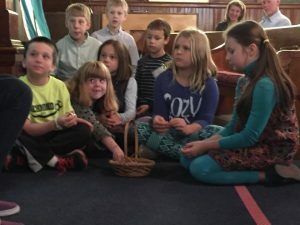 Children begin in worship and leave for Sunday school classes after the Children’s sermon. During the summer months, special activities are planned for the children and there is no nursery care. Our “Meet Me At The River” summer program is for children ages 5+. After the children’s message, we go the the park at Volunteer’s Green (weather permitting), to have a Bible story/activity and play time, then return to church to meet our families. 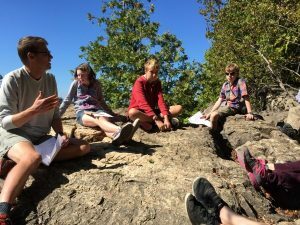 Traditionally, a Confirmation classes for young people in grades 7, 8, or above is held ever other year. Our most recent class was confirmed June 3, 2018. At or after the Confirmation ceremony, Confirmands are given the option to join our church. Adult Education and Bible Study series are offered throughout the year. Announcements are made about specific series and retreats in the Sunday bulletins, weekly emails and bi-monthly newsletter. The Christian Education Committee has been working for the past few months to create “Safe Conduct Guidelines” for volunteers working with children and youth at RCC. We understand the importance of keeping our kids safe and protecting them from uncomfortable and sometimes dangerous situations. We have also crafted a mandatory “Screening Form” for our volunteers to complete, to help us better know them. The form also gives volunteers the opportunity to share their previous experience and to select the age(s) or type of activities they prefer to lead. Signing the form will confirm that you agree to follow the guidelines, and will grant us permission to run a criminal background check through the state of Vermont.